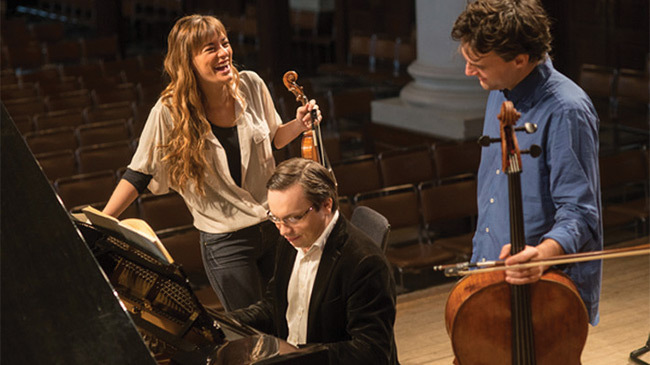 Acclaimed leading soloists of their generation, violinist Nicola Benedetti, cellist Leonard Elschenbroich and pianist Alexei Grynyuk have been performing together as a trio since they met as young music students in London. Their passionate commitment to chamber music has earned them compelling performances at prestigious concert halls worldwide. Join us for the Midwest premiere of Turnage: Duetti d’Amore along with works by Schubert, Brahms, Ravel. Leonard Elschenbroich, described by The New York Times as “a musician of great technical prowess, intellectual curiosity and expressive depth,” has established himself as one of the most charismatic cellists of his generation. His many awards include the Leonard Bernstein Award, Förderpreis Deutschlandfunk, Eugene Istomin Prize, and Borletti Buitoni Trust Award. Alexei Grynyuk performs throughout the world and in recital at the Great Hall of Moscow Conservatoire, Wigmore Hall, Southbank Centre in London, Salle Cortot and Salle Gaveau in Paris, Musica Sacra Festival in Netherlands, Duszniki Chopin Festival in Poland, Otono International Music Festival in Madrid, Metropolitan Museum of Art in New York and other prestigious festivals and venues. Auto-Owners Insurance Performing Arts at City Opera House is made possible in part by our generous sponsors, the Michigan Council for Arts and Cultural Affairs and the National Endowment for the Arts.